The Regal Red Japanese Painted Fern is a newer brighter version. Athyrium niponicum 'Regal Red' brightens woodland garden settings. 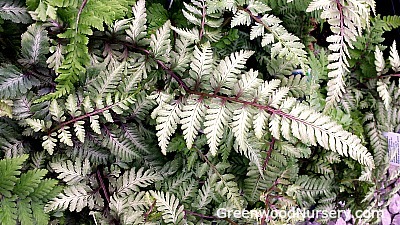 Red fronds are deeper adding almost violet shadings with bright silver edgings. Plant Regal Red Japanese Painted Ferns in lawn edges and containers in shaded areas. Japanese Painted Fern companion plants are heuchera or coral bells, lenten rose or hellebores and dicentra or bleeding heart. Clip back old fronds once your new growth begins in spring. During the growing season, feed with a general fertilizer. The Regal Red Japanese Fern prefers constant moisture. Orders shipping to AZ or CA addresses will be bare rooted before being prepped for shipping.